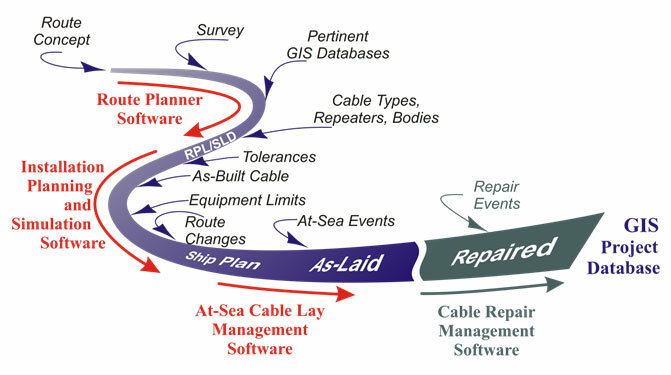 MakaiLay Repair extends the capability of Makai’s industry-standard submarine cable planning and installation software suite to include at-sea cable repair and recovery operations. It is a standalone product which runs on a standard PC operating with Microsoft Windows XP/7/8 which is installed on a repair vessel. The software is available in two versions, 1) Standard or 2) Professional (Pro), depending upon client needs. c. Steady-state calculator of the cable shape, position and tension for planning and monitoring repair operations. MakaiLay Repair shares the same Graphical User Interface (GUI) as MakaiPlan and MakaiLay, the submarine planning and at-sea installation software products. This provides a familiar feel for route planners, at-sea installers, repair operators and project managers yields a common basis for thinking about, planning and executing operations. Users experienced with MakaiLay can step right in and use MakaiLay Repair with little training. MakaiRepair is a extension of the GIS project database used in planning, simulating and installing submarine cables. 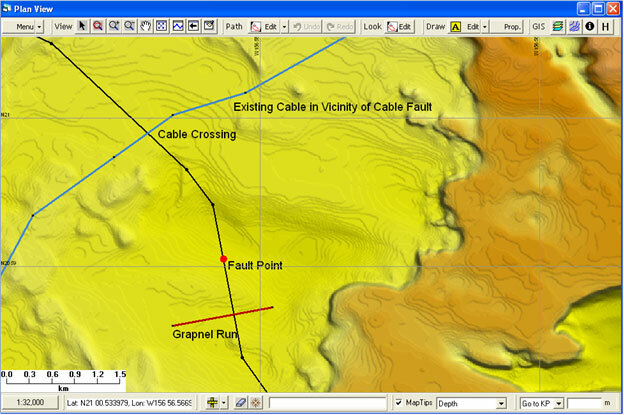 As with Makai’s other cable software products, MakaiLay Repair provides a GIS environment capable of importing and manipulating a wide variety of geo-referenced data including bathymetry, bottom slopes, nautical charts, annotations, restricted areas, soil types, and paths of existing cables in the region. All this information is viewable on a single display so operators can make informed decisions without consulting multiple sources of information. 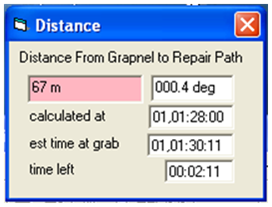 Screenshot of MakaiRepair showing grapnel run next to fault location of cable. Other GIS information, such as bathymetry, existing cables in the vicinity, and marine hazards, can also displayed. Furthermore, planned and as-laid cable routes generated in Makai’s other software products can be seamlessly integrated into MakaiLay Repair. If a cable was installed using MakaiLay, the resulting as-laid path can be imported into MakaiLay Repair, annotated to note the approximate location of the fault, and used to plan and execute the repair operation. If using Repair Pro, the resulting as-laid path of the repaired cable can be updated and loaded back into the project database. Unlike standard cable laying operations, repair operations can involve the use of multiple cable engines simultaneously. This capability is useful when one section of the cable is being installed and the other is being retrieved prior to repairing the cable with a splice. The waypoints of the ship can be changed “on-the-fly” at-sea to account for ocean currents or surface obstacles such as other ships which need to be navigated around. Using the same system server utilized by MakaiLay, these ship plans together with other relevant information (e.g., nautical charts) can be displayed directly to the helmsman and cable engine handlers, or any other client computers located on the vessel. All data critical to repair operations are logged by MakaiLay Repair including time-tagged navigational and cable engine data. As mentioned previously, MakaiLay Repair has the capability to receive, log and filter data from multiple cable engines and this data can be displayed, corrected and exported using the same charting and query utilities of MakaiLay. MakaiLay Repair also contains a customizable database to log events during repair operations. All events in the database are time-tagged and categorized to facilitate rapid searching while at-sea or reporting once the repair has been completed. MakaiLay Repair includes several tools to assist operators to make key decisions before and during the operation. 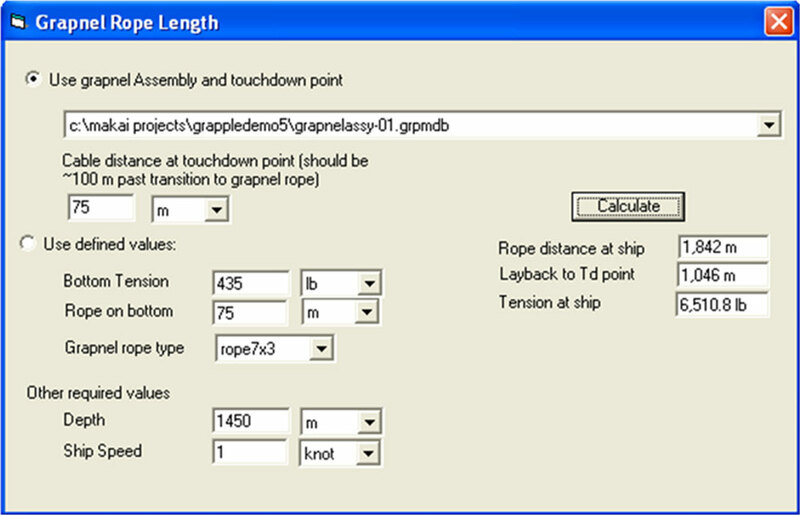 For example, there is a tool to calculate the required grapnel rope length for any user-defined grapnel assembly or the expected bottom tension. It takes into account the user specified water depth and Ship speed and estimated the length of Grapnel Rope required to ensure proper touchdown of the grapnel while grappling. It also includes a buoy selection tool that takes into account the user specified buoy assemble and given expected ocean currents. Using the results of these tools allows an operator to create an assembly appropriate for any particular operation which can be printed in schematic form for easy rigging. Central databases including all the grapnel and buoy assemblies can also be created to facilitate their rapid inclusion in future projects. Screenshot of the grapnel rope length tool. The Professional version of MakaiLay Repair includes a real-time, 3D hydrodynamic model to accurately monitor and control each phase of a repair operation. Multiple benefits are provided by using the cable model at-sea such as mitigating risk (such as breaking the cable or damaging it by excessive dragging along the seafloor) due to operator error and significantly increasing the safe recovery rate of cables. Unlike conventional cable lays, multiple cables can be in the water column and connected to the vessel simultaneously during a repair operation. The cable model used by MakaiLay Repair is an expanded and enhanced version of the same cable model used by MakaiLay which allows for the real-time modeling of multiple cables simultaneously. It takes as input the cable and body properties, as-laid paths, navigation and cable engine data to calculate the cable position and tension. It is capable of modeling all phases of a repair operation including grappling operations, retrieval, buoying, simultaneous installation and recovery, splicing, and re-installing the repaired cable. 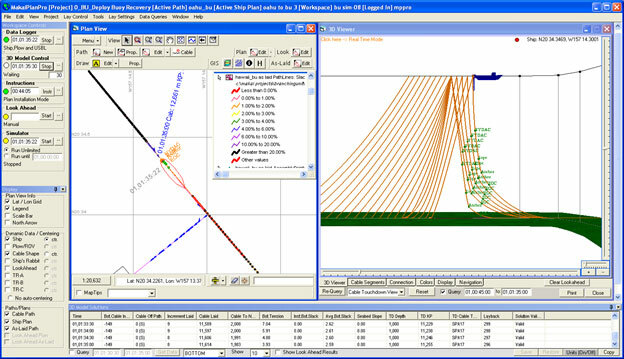 Using the model as a monitoring tool provides operators with real-time knowledge of the shape of the involved cables between the ship and the seabed, as well as a reliable record of touchdown positions. Charts are available to display the calculated tension of the array at the bottom as well as the distance the cable has dragged. Because the model is optimized for repair and recovery operations, it converges significantly faster than real-time. Consequently the operator can accurately predict how a given set of instructions will affect the cable tension and position (e.g., cause the cable to drag across a rock outcrop or induce dangerously high tension) before it actually happens. This capability allows the software to be used as a feed-forward control tool to generate “on-the-fly” instructions to reduce risk and safely install and/or recover multiple cables simultaneously. During unplanned contingency situations, the results of the tool can be used to inform operators as they make rapid decisions must be made to preserve operator safety and prevent further damage to the cable. MakaiRepair Pro uses a 3D finite segment model that has been optimized for repair operations. The model differs from the standard MakaiLay model in that it takes into consideration multiple cables in the water column and cable dragging on the seafloor. 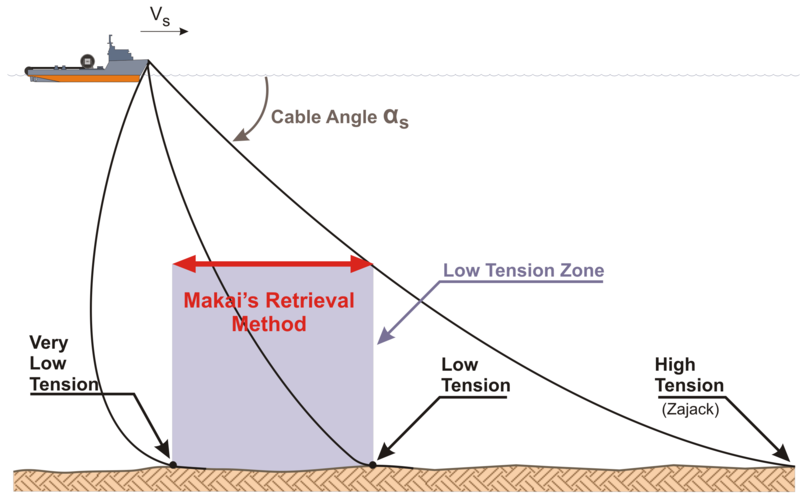 Maintaining a desired working load of tension during retrievals is crucial to 1) maintain safe working conditions which mitigate the risk of cable breakage, 2) prevent damaging the cable by excessively dragging it along the seabed, and 3) ensure that cable is not being retrieved at zero tension in which case it will loop around any bottom outcrops present . Conventional methods of cable retrieval are based on steady state approximations and do not provide repair operators with an accurate understanding of, or control over, the cable tension at the seabed. 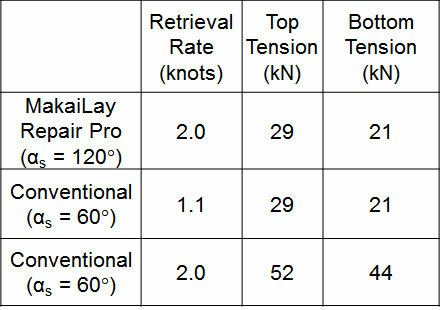 Consequently, repair operations are conducted at slow speeds (typically less than 1 knot) and with low top angle (around 60 deg) to ensure that they maintain desired bottom tension. This can become costly when retrieving substantial lengths of cable. MakaiRepair Pro allows engineers to increase the rate of cable recovery and payout while operating in low to very low bottom tension. MakaiRepair Pro can drastically increase the rate of cable recovery and re-lay while maintaining safe bottom tension values.